The Vision Cast VR Headset will bring you an amazing virtual experience that you can't afford to miss! We are US company located in Portland, OR that has been developing premium electronics for years! 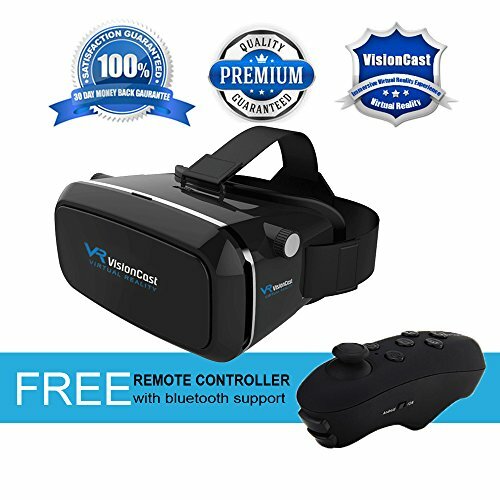 We guarantee the VR Vision Cast headset to be the highest quality and we offer a no-risk no-hassle 30-day money-back guarantee. Scroll up to the top and click Add to Cart so you can have your own personal Virtual Reality experience! ADJUSTABLE FOCAL AND DISTANCE LENGTH - These VR goggles adjust for eyes with nearsightedness and farsightedness! Focal length has a range of 20mm while distance adjusts up to 5mm. VENTILATION AND THERMAL DESIGN - There is no overheating in the VisionCast VR Glasses thanks to the carefully designed magnetic ventilation panel that allows you to keep playing games and watching movies in complete comfort. SUPER COMFORTABLE - Quality leather padding formed to fit facial contours. Ultra plush elastic headband keeps the virtual reality headset safe and secure so you can move around with ease. MONEY-BACK GUARANTEE - We are a US company located in Portland, OR that has been developing premium electronics for years and offer a No-Risk 30-day Money-Back Guarantee. Scroll up to the top and click Add to Cart to change the way you experience games and movies forever! If you have any questions about this product by VisionCast VR, contact us by completing and submitting the form below. If you are looking for a specif part number, please include it with your message.